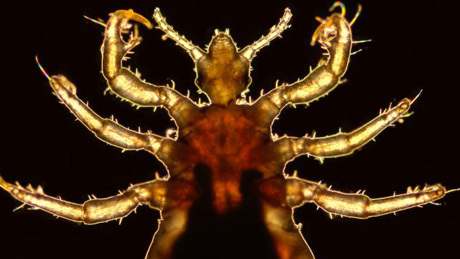 Exploring Human Evolution and Culture through the Study of Lice. Yesterday evening I took the time to watch Nova Science NOW hosted by Neil DeGrasse Tyson. Although I enjoyed the entire program, I was especially intrigued by the segment on the research of David Reed at the University of Florida’s Natural History Museum. This segment discusses how molecular comparisons of our clothing, head, and pubic lice with the head and pubic lice found in chimpanzees and gorillas, respectively were used to infer the time when modern humans began wearing clothing, and when ancestral humans lost most of our hair. With so much in the news lately about the diversity of human microbe flora, etc… this research could provide a clear example of the distinct niches that are found on the human body. Watch the 11 minute segment at the Nova ScienceNOW, and then read the summary article In Lice, Clues to Human Origin and Attire from the New York Times, or download and read pdf’s of the scientific research below. Origin of Clothing Lice Indicates Early Clothing Use by Anatomically Modern Humans in Africa from the journal of Molecular Biology and Evolution. A list and some links to other publications can be found at Dr. Reed’s website. I think this would make a great bioinformatics/molecular clock activity as well.